, fjs = d.getElementsByTagName(s); if (d.getElementById(id)) return; js = d.createElement(s); js.id = id; js.src = "//connect.facebook.net/en_GB/all.js#xfbml=1&appId=126784710754625"; fjs.parentNode.insertBefore(js, fjs); }(document, 'script', 'facebook-jssdk')); Like this post if you've been/are in love. I don't claim mastery of love as an emotion, a place and a gift. I think love and life is equally as complicated and ironically, the two are beautiful and more enigmatic with their complexities--so imagine my surprise to be floored by it in its most innocent form: young love. It's different to feel, fight, savor and explore love with an "adult" mind. It's different to hear about it when it's fresh, it's crater still warm and untouched. 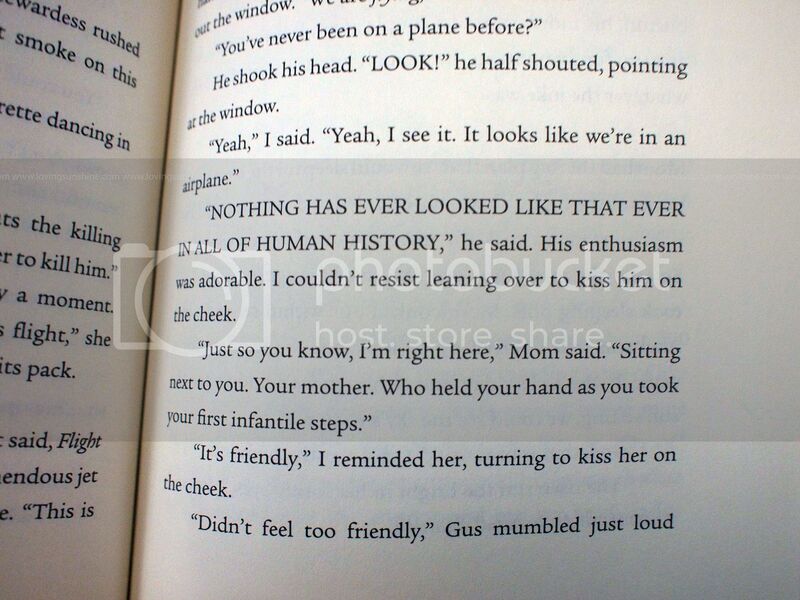 That's what The Fault in Our Stars by John Green is all about. I never learn, I always judge a book by its cover (and title); but the reason behind my being stubborn is the likes of The Fault in Our Stars. I picked out the book while walking around SM Ilo-Ilo in search for a "beach book". Completely estranged with the author's identity and the book's popularity, I dove in and drowned magnificently with words so simple yet so sufficient in describing what it means to have a hand to hold right before oblivion comes right through the door. I don't know cancer like some people know. I know people who has it, some of which are family which statistics would suggest to be sound reason to treat me as a candidate for a certain cancer flavor, but I don't know the disease despite my proximity to it. But I know love. I know what it's like to be in love: puppy, young, flirty, lustful, demanding, determined, etc. 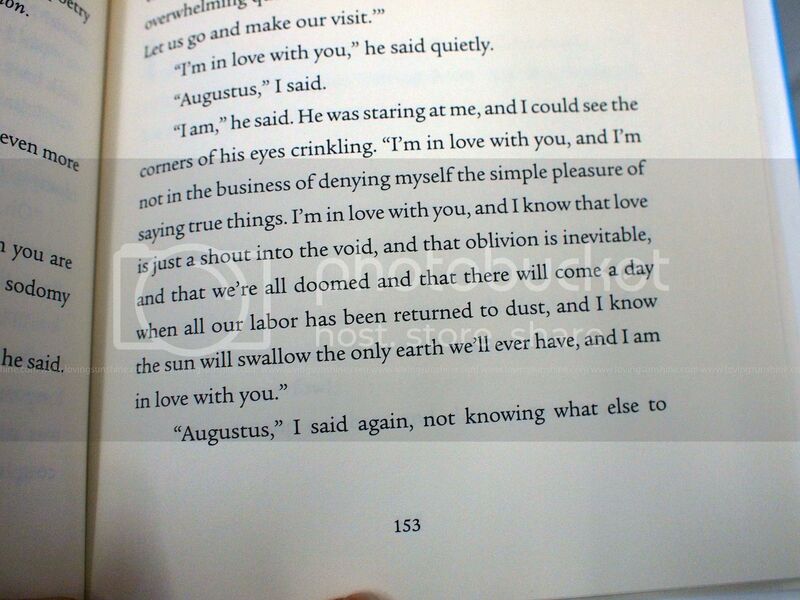 This book, The Fault in our Stars is a revelation. It provides any brave reader witness what love is like against the beauty of life amidst the shadow of death--which healthy or not, we would all have to face. 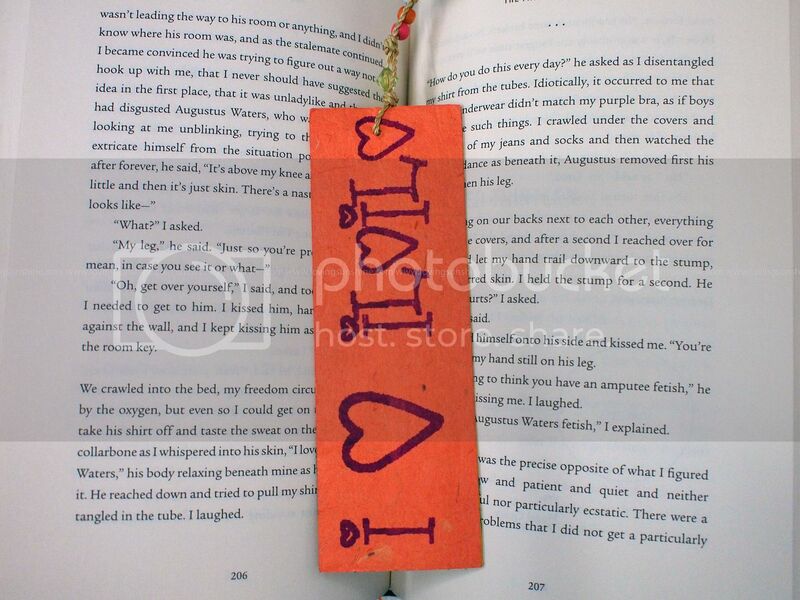 The book was angsty, feisty, innocent, flirtatious and deep. I fell for it hard. Each turn of a page, I sank deeper. It was like I was diving for a hard to find ship of dreams... without knowing if it were even true. Oh, but it was. It is true. 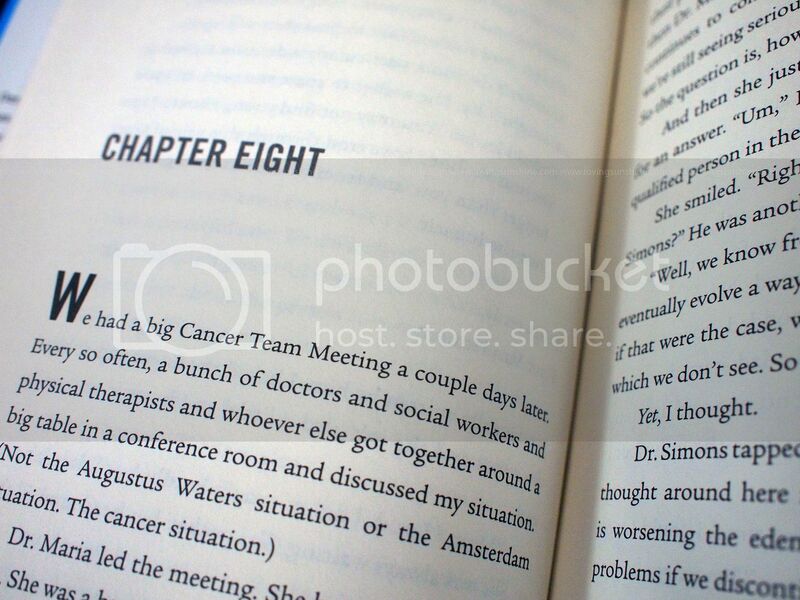 I've never dreamed I would read a book like The Fault in Our Stars. It made me shake and ignited me to the core. It made more conscious of the circus I share the room with. I wasn't able to stop reading it. I bought it, I read it while eating. I read it while walking. I read it in the darkness. I read it and conquered it until the wee hours of night cause I was unable to put it down. 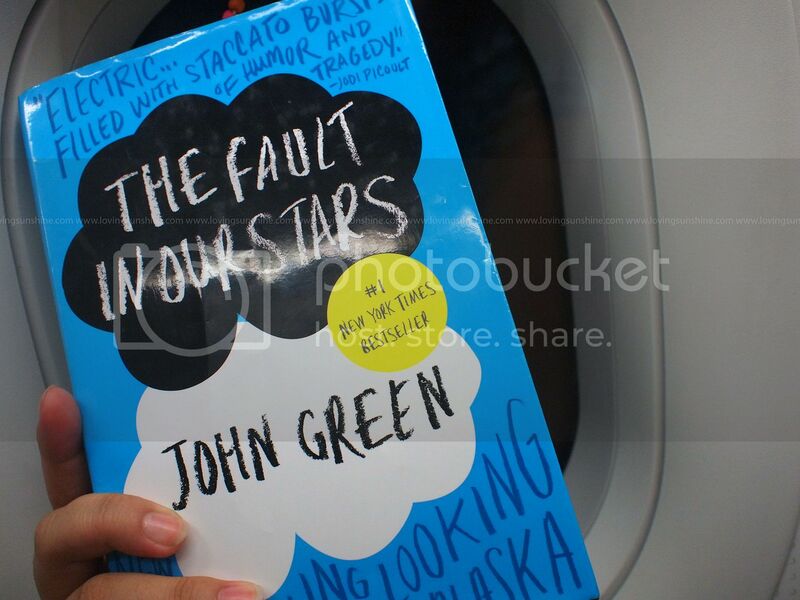 It was so entertaining and inspiring to be embraced by a story like that of The Fault in Our Stars. Truth is, I'm thankful I read the book. It's not that the world would not be perfect if people won't read it. What I realized after reading The Fault in the Stars is I would be crippled to see and marvel at the perfections hidden between the faults of this world, if I didn't read John Green's epic story of young love. As usual, when I read a good book I prophetize about it... and I'm so excited because in the two occasions that I read the book from beginning to end, as if dictated by fate, every time I am on chapter eight, I would text a very lucky friend, divulge the title of this new discovery and offer to even lend my book just to ensure that my chosen friends would know what I'm talking about. Below are teaser shots of a few of my favorite sections of the book. If your name is Abigail Juaner, I suggest you don't zoom into the pictures... although I would understand if you surrender for obviously, these photos are temptations of strong magnitude. But if you really can, DON'T READ THE PHOTOS. And all you have to do is hit RETWEET button of this tweet. Like this post if you've been/are in love.